I haven't posted one of these GQD's for nearly two weeks, mainly because there haven't been too many nonsensical environmentally-minded quotes by anyone lately...which I guess is a good thing. Unfortunately, that tells me that the environment is currently not on the average person’s radar (nor any media's for that matter)…and that’s very disconcerting. Today's Environmental Gibberish Quote of the Day (EGQD) happens to be from the climate denier extraordinaire - President Trump himself. Then he doubled-down with his ignorance just the other day saying, "Be careful and try staying in your house. Large parts of the Country are suffering from tremendous amounts of snow and near record setting cold. Amazing how big this system is. Wouldn’t be bad to have a little of that good old fashioned Global Warming right now!" 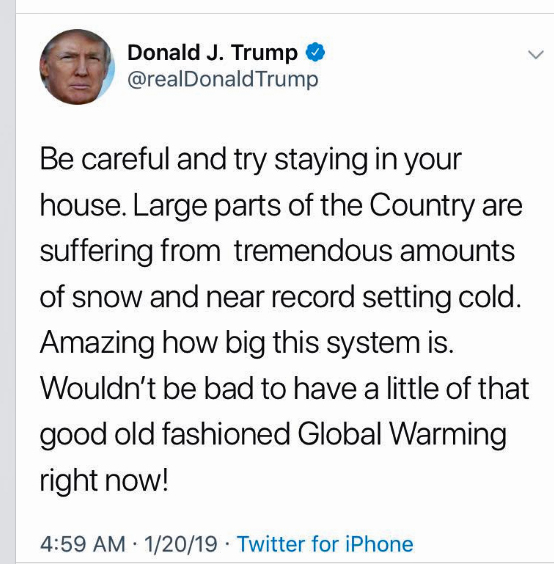 But if he were paying attention, he'd know that Alaska is experiencing some exceptionally warm temperatures. In Southwest Alaska, they've had their normal cold snap or two - one stretch hitting -41 degrees. But as you can see, just a few days later it was above freezing for several days. This trend of four to five meltdowns per winter has now been going on for at least the past five years. So climate change - or as the President call it, global warming - it's real and it's happening right before many people's eyes. It's a sad and scary when the leader of such a powerful and influential country makes a mockery of a very serious situation.